The State of Games, Episode 5 is alive! And this may be our most controversial episode yet – at least amongst the rabid Cthulhu Mythos gamers amongst you. 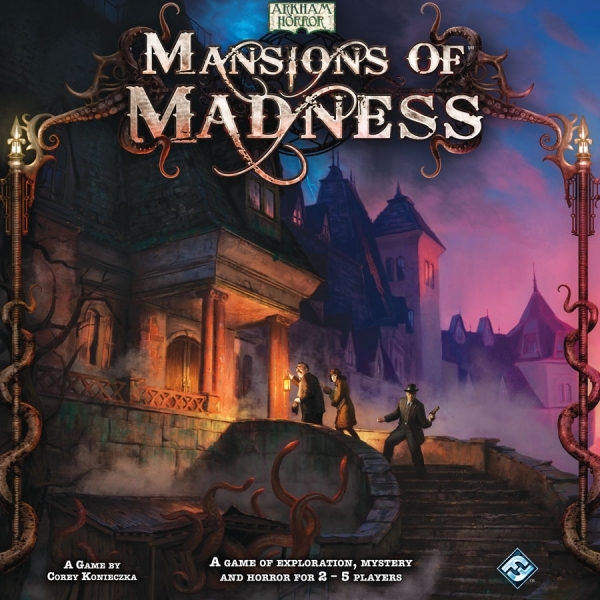 Bear with us, Lovecraftian fiends, we promise you the stars are right to talk of Things Man Was Not Meant to Know… About Mansions of Madness! See that box over there? Yeah, the cool-looking one with a spooky old mansion and pulpy investigators and all manner of creepy, tentacular goodness – looks pretty awesome, doesn’t it? Well, don’t judge a book by its cover. Inside that box, lies a big ol’ hot mess – it’s filled with typos and long sheets of sanity-sapping errata, and non-Euclidean geometry… I swear I saw some snippets from the Necronomicon where even Shub-Niggurath’s name was misspelled. The good news is that it weighs close to seven pounds, almost big enough to fend off a shoggoth, as long as he’s busy eating someone in the meantime. Kristian Bunkholt Nauste of Norway – Good luck on your thesis! Got the game before the weekend, just in time to try it out a couple of times before listening to the podcast. Needs a revision of the rules. Keeper has to fill in the gaps and adapt, or else the stories might not make any sense. I really wanted to love this, but so far I merely like it. Seems to hit an uncanny valley between RPG and boardgames. And I love both. Couple of friends though loved it. We’ll try it again, and if anything I might pass it on to them. Green eyed boy was okay, but you are dependent on creating this “traitor” atmosphere that my players just forgot all about. They even talked about killing the weakest character off since he was dragging them down, which would have netted me an instant win. The group stayed together for the whole game, and trailed the clues perfectly. Still lost (as did I, the keeper) because of time running out. 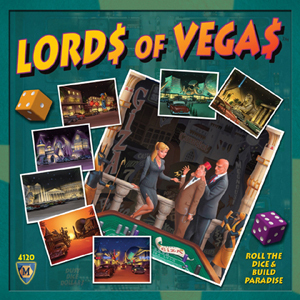 Also, I’d really like to get my hands on Lords of Vegas. Too bad it’s almost impossible to find in Norway now… Waiting impatiently. What a disappointment in Mansions of Madness. So, question… I’m assuming that there’s more than one “Win” condition for the Keeper? If the players discover the idea of not entering the freezer (or have played the scenario before) how could the keeper possibly win if they just avoided it? Kristian – Great comments, thanks! I, too, love RPGs and board games, and I was hoping this would be a great gap between the two. So far, that’s not the case. I find Arkham Horror fits that bill much better, at least until something truly unique that bridges the gaps comes along. So everyone lost because the investigators stayed together? Hrm… as I expected. This game has far too tight of a time limit to keep everyone bunched together. There is very little margin of error – not surprising since we died in turn 4. Wish I could help you out with Lords of Vegas – it’s a really great game! Keep the faith, it’ll come out your way soon, and it will be worth the wait. Wolfie – Yeah, there are typically three different selections that the Keeper can make for each story, so it’s possible to play Green-Eyed Boy with two other win conditions. However, the play was so sullied by what happened the first time that no one wanted to go near that scenario again. Also, another drawback is with the limited puzzles and items – they’re almost all the same from story to story, so it gets a bit stale too quickly. It was a nice surprise to see that you now have a podcast (I’ve been under a rock for a few months…)! Great stuff Chris, I needed a new podcast to listen to during my Southern California commute from hell. 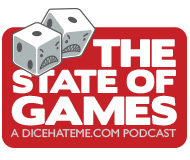 I’ll be adding The State of Games to the list of upcoming podcast reviews, can’t wait to hear the next one. Jack – Good to hear from you! I’m glad you found the podcast – and even more glad you’re enjoying it. Let us know if there’s something you’d like to hear. Be safe out there on the freeways, and keep in touch! Loved your podcast (as usual), and especially appreciated your willingness to be candid and speak of the problems you perceived in MoM (all the more since so many people have been singing its praises and it is prone to getting more than its fair share of rabid love). Lucian – Thanks! And thanks for listening – I’m glad you could appreciate our candid look at MoM. I don’t usually like to trash talk a game, but I felt like people needed to know about this one!